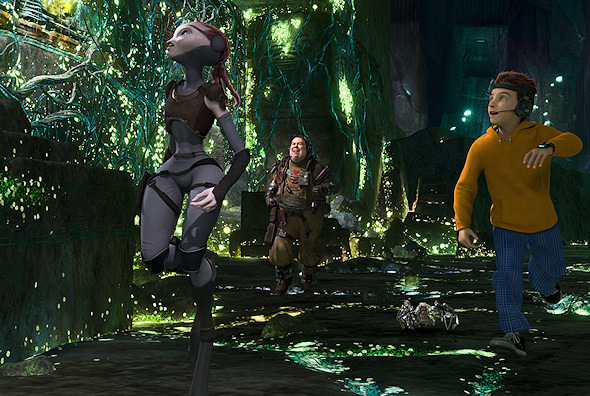 ‘Mars Needs Moms’ was actually a whole lot of fun. I was very surprised on how much I liked it. I’ll be honest, I went into watching the film expecting a complete turd, but I was surprised by how adult it was along with it being hilarious, and completely thrilling. This movie was really a good time. It was funny, smart, and exciting all in one. This release comes in a combo 4 pack meaning you get the 3D Bluray, the 2D Bluray, the DVD, and the digital copy. The title of the film ‘Mars Needs Moms’ says it all. And that is the basic premise of the story. Mars kidnaps moms from EARTH and steal their motherly qualities for their own kind via some kind of machine that ultimately kills the mother. We meet Milo (Seth Green) who is a nine year old boy who loves zombies and horror movies. Now I remember when I was that age, I didn’t want to listen to my mother. I didn’t want to eat my vegetables, and I didn’t want to do my chores, and I always argued with my mother about that sort of thing. This is the sort of thing that goes on between Milo and his mother (Joan Cusack). Not too much time passes when Milo’s mom is kidnapped by aliens and taken to Mars. Milo witnesses this and climbs aboard undetected onto the alien spaceship and stows away until they land. One thing I noticed, that not many animated movies did, was that when the alien craft departed from Earth’s atmosphere, the G-Force hit so great the it showed Milo passing out. Pretty accurate. I thought that little detail was great. Once on Mars, it is a timed rescue to save his mother until she is killed. 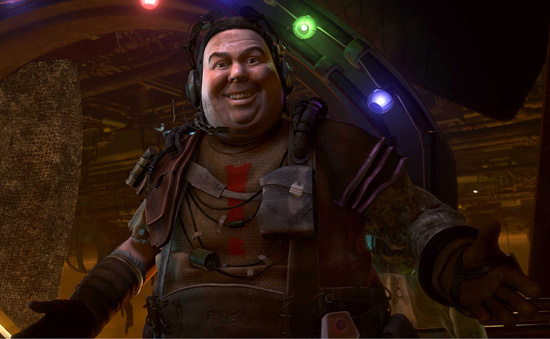 Milo happens to come across a human of all species named Gribble (Dan Fogler) who we learn has been on Mars for a long time, but we don’t know why. Gribble helps Milo find his mother and rescue her. In their rescue attempt Milo comes across a friendly alien who is obsessed with the 1960’s by the name of Ki, who helps Milo as well and ultimately discovering the ultra secret that has kept the aliens on Mars from being happy. I was so surprised on how good this movie was. There is no bathroom five year old humor in the movie. It was all really adult and had some really great jokes throughout the film. It was action packed and a whole lot of fun to watch. The CG animation was out of this world. It was all motion capture. Kinda like how Gollum and King Kong was made to look real. Everyone did such a great job with this film. You need to check it out. Worth purchasing. The video is presented in a stunning 1080p AVC codec with a 2.40:1 aspect ratio Mars Needs Mom could be a demonstration Blu-ray for you HD setup. The colors are flawless in every way, and the blacks are deep and smooth. The textures just pop out at you and are perfect. There was no noise, grain, flaws, or artifacts that I noticed. This is definitely a demo quality blu-ray. The DTS-HD Master Audio 7.1 surround track is AMAZING. Your entire system will get the full on exercise for this film. The dialogue is crystal clear and the action sequences packs one hell of a punch on all your speakers. You will feel like you are on Mars with Milo. The audio will take you deeper into the film. Definitely demo quality. ‘Mars Needs Moms’ is a great film. It is fun for the whole family plus more. I really was shocked on how good this move was. The audio and video was top notch and demo worthy. I had hoped for better extras on this release, but maybe next time. I highly recommend this film. You should enjoy it as much as I did. 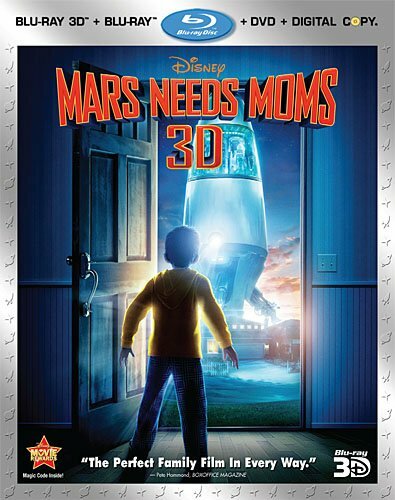 Find out all the info about ‘Mars Needs Moms’ HERE FROM DISNEY. This entry was posted on Monday, August 8th, 2011 at 11:56 pm	and is filed under Film, News. You can follow any responses to this entry through the RSS 2.0 feed. You can skip to the end and leave a response. Pinging is currently not allowed. « BRYAN’S MUST OWN BLURAY/DVD’S FOR THE 2ND WEEK OF AUGUST!! !